Combine the almond milk, water, quinoa, cinnamon, zest, and 1 tablespoon honey in a medium sized sauce pan. Bring mixture to a boil. Lower heat to medium-low, cover and simmer until liquid is absorbed - about 15 minutes. Remove from heat, keeping covered, and let sit for 5 minutes. Gently stir in berries. Drizzle with honey just before serving and garnish with almonds. I highly recommend trying quinoa if you haven't already. It is one of the most nutritious grains available and very tasty, which makes it an excellent choice for a pantry staple. Quinoa (pronounced keen-wa) has a similar texture to couscous, but a little more crunch and a slightly nutty flavor. The Incas called this ancient food staple "The Mother Grain." Quinoa contains more protein than any other grain and is classified as a "complete protein" and contains slow-releasing carbs to help maintain blood sugar levels. 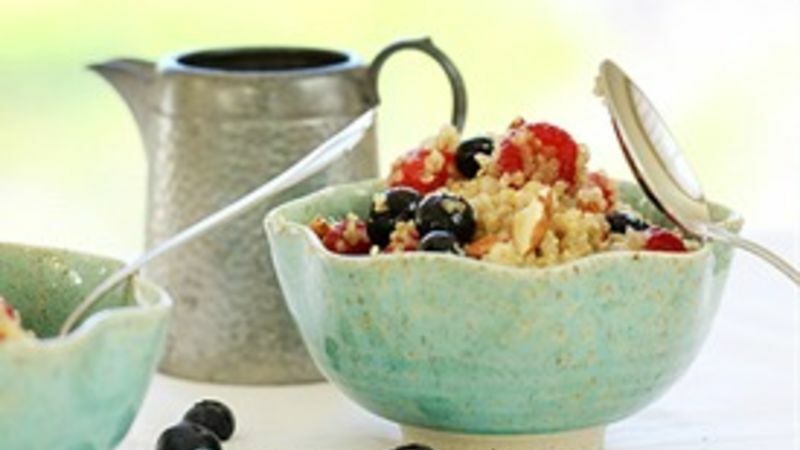 It is also a very good source calcium, iron, phosphorous, B vitamins, and vitamin E. Quinoa is a great grain substitute for rice if you are aiming for healthier meals. I love quinoa, but I've only ever had it in savory dishes. Recently I had the opportunity to try a breakfast version of a quinoa salad. It was loaded with berries and had a slight citrus hint to it. I wanted to recreate the dish at home, and so here it is: Citrus Berry Quinoa Salad. This would be perfect for a brunch or big breakfast as a side dish (which is how it was served when I ate it), but it would also be great as a breakfast dish alone since it is packed with protein, vitamins, minerals, and fruit. The perfect dish to get you going with the energy you need.